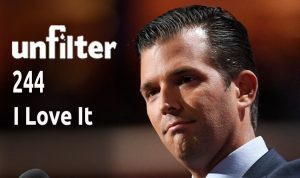 New emails this time from Donald Trump Jr expose potential intention to collude with the Russian government to get dirt on Hillary. But could it all be a dirty Fusion GPS trap? Plus the “Cyber Threat” that was a cyber flop, Nevada’s weed emergency & more! Jokes about Trump being gay draw on deep-rooted stereotypes about gay men and power.